Com apenas um dia para passar em Ronda, uma visita guiada garantirá que você verifique todos os destaques. 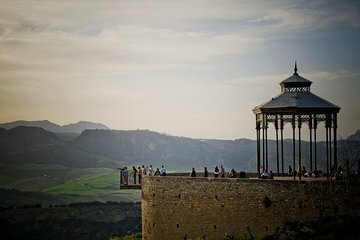 Nesta excursão de dia inteiro saindo de Sevilha, visite a famosa praça de Touros Plaza de Toros, desfrute de vistas espetaculares do Desfiladeiro do Rio El Tajo, experimente vinhos andaluzes no Museu do Vinho de Ronda e desfrute de um passeio a pé opcional pelos históricos Pueblos Blancos. O passeio de grande valor inclui o embarque no hotel, as taxas de entrada e o transporte de ida e volta a partir de Sevilha. I was so excited for this day trip before we went! Ronda is certainly beautiful but it is much more touristy than I had anticipated. Our guide on the bus to Ronda was informative, but for it being in English I had some questions during that were lost in translation and not understood. It wasn't a huge deal, just noted. Also, if you are wanting this trip because you are wanting the picturesque scene of the bridge and cliffs looking up from the base...you will not get it on this tour. The tour takes you to the top of the cliff and across the bridge. The tour through the bull ring is really interesting and was one of the highlights. You will tour through the stables and into the ring, and lots of history on the sport that was very informative. As for the wine tasting...if you like wine...the wines were TERRIBLE. You go to a winery and are there for about 15-20 minutes and there are barrels on the wall you go and fill yourself. It was so packed when we went through with other tour groups, people were shoving and cutting in line to get more wine. If you just have the goal to get tipsy you could certainly hold your nose and shoot some back, but if you're anticipating sipping a nice wine and enjoying good conversation with strangers and a nice view, this isn't it. It was a decent price for getting a ride to Ronda and getting some history while we were staying in Seville for a few days. If I could do it again, I would have rented a car, driven myself and taken a tour once there, and then had the freedom to walk the trail to the base of the canyon and explore the city more on my own and to have stayed a night. One day/night there is certainly enough to see and do plenty.